While the web is dynamic and real-time, mobile marketing is often not. And that causes a lot of headaches for developers who look to ads to not only monetize, but also market their apps and build relationships with users. But PlayHaven, a San Francisco start-up, is looking to bring the real-time web to mobile marketing with a new platform debuting today on iOS (s aapl) that gives mobile game developers the ability to react quickly to their shifting needs as they arise. What this means is that developers will be able to tailor and configure their outreach through mobile overlay ads on the fly, allowing them to emphasize monetization one moment while pushing engagement or app promotion another. This happens through PlayHaven’s platform, which utilizes customizable HTML5 overlay windows that can appear at various moments in a mobile game app. Developers can install the PlayHaven SDK in a game in about an hour or connect to PlayHaven’s web-based APIs. Typically, developers must install third-party SDKs for things like monetization or ads, but putting one in or taking one out requires an update and a review from Apple. But with one installation of PlayHaven’s SDK, developers don’t need to get successive approvals for any changes they make. That’s because they can now control and program their overlay window from a web dashboard, giving them the flexibility to make tweaks instantly. So if a developer wants to reward users upon opening up an app for the first time, leveling up or for using a game around a holiday, they can program the window with a new message on the fly offering virtual goods that utilizes PlayHaven’s reward system. When they’re looking to emphasize monetization or promotion, a developer can use the window to promote another one of their own apps or alert people to an update. Or they can tap into PlayHaven’s app promotion network and use their space to promote other apps. And this can also change from moment to moment and all the differences are reflected instantly in the app. Developers can apply frequency capping and time restrictions for messages and they prioritize the order in which certain messages go out. And they can have control over the font, image and colors they use, allowing them to A/B test different combinations to see which are the most effective. PlayHaven also provides analytics to help developers to understand what’s working and what’s not. This kind of iteration happens in a lot of online social games, but it generally hasn’t come to mobile game apps. But now, PlayHaven’s offering it to game developers and many are excited at the prospect. Mobile game developer Glu (s gluu) just signed on with the platform and Half Brick, maker of Fruit Ninja, is also using the new tool. Andy Yang, CEO of PlayHaven said it’s all about giving developers more tools to quickly respond to their needs. And that, he thinks that can boost developer revenues by 10 times or more. Yang said developers may still employ other mobile ad SDKs and monetization tools, but he’s hoping he can partner with some companies and offer it all through one package. He’s planning on also adding video ads and other cross promotion tools to the platform. I think this makes a lot of sense for developers. They often have goals that shift on the fly. Sometimes, you’re looking to just drive retention and engagement, and at other moments you want to push monetization. By using a tool like PlayHaven, you can be more responsive and better own the relationship with a user. Overall, I think this is the way advertising will need to go. Static mobile campaigns or slowly moving outreach just can’t cut it for developers, who want to constantly tweak their efforts to see what works. 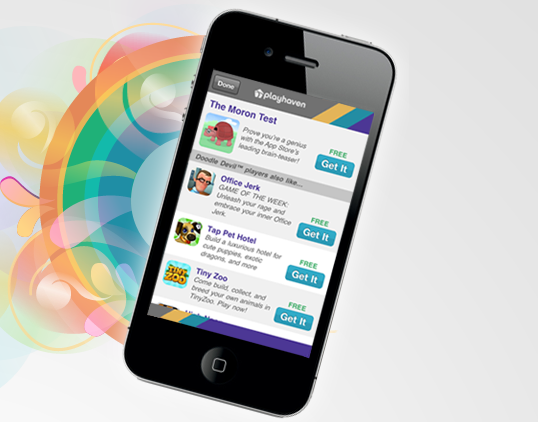 Since launching in May of 2010, PlayHaven has been used in more than 750 games and has reached 36 million unique users. The company has raised $3 million so far from BV Capital, Tandem Entrepreneurs, Charles River Ventures and Light Speed Partners. I think this is a paid article. I dont think the writer actually knows what he is talking about. The USA algorithm corrects when you have Playhaven. I know this for a fact. We had the unfortunate instance that we used Playhaven and saw a serious decrease of downloads when we used it. Apple does not approve of it, and will not admit to it in public but Playhaven or any other cross media install software will cause Apple to get you less downloads. You will not make the lists. Dont suffer the same mistake we did. This is great! Real-time marketing on multiple platforms. What do you think has been the biggest hurdle that you have experienced?